Grace Fellowship of Alta Loma, California, celebrated their 30th anniversary Sunday morning November 18th by burning the mortgage. Pastor Roy Halberg, along with the church elders, Kevin Fairchild, Dan Magnusen, and Carlos Lascaibar, led the church family in celebrating this great milestone. By the providence of God, former pastor, Neil Cole, was also present along with his wife, Dana, and their son Zach. Kevin Fairchild was a high school student when Grace Fellowship began with a Bible study in his parents’ home. Having been a part of the church family since his youth gave Kevin a unique perspective as he shared in the service by highlighting the church’s history through photographs that included the first baptism service, the ground breaking ceremony, and the construction of the church building. After Kevin’s look back, Pastor Roy looked forward, addressing the theme “Grace Fellowship- The Next 30 Years” stressing the church’s ambition to demonstrate love for the Lord by loving the lost and seeking to introduce them to the Savior. 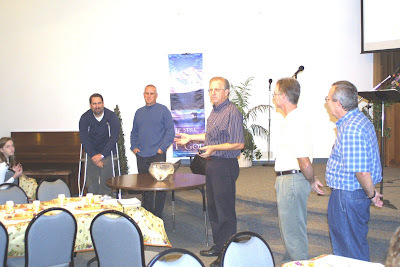 The morning celebration concluded with lunch and a three-fold communion service.